The unusual geological characteristics of the seabed and underlying sediments south of the epicentre of the 2004 Boxing Day Sumatran-Andaman earthquake contributed to the devastating power of the resulting tsunami, according to research involving University of Southampton scientists. "Our findings published in the scientific journal Nature Geoscience will help Earth scientists assess earthquake hazard and the risk of large destructive tsunamis globally," says University of Southampton geologist Dr Lisa McNeill, co-author on the paper, who is based at the National Oceanography Centre, Southampton. On 26 December 2004, a powerful 'megathrust' earthquake struck to the north of Simeulue Island, Indonesia, rupturing part of the Sumatran-Andaman margin plate boundary. The resulting tsunami ranks as the deadliest ever recorded in modern times. It inundated low-lying coastal regions and islands around the Indian Ocean, leading to massive infrastructure damage and loss of life. Despite the enormity of the earthquake, the size of the tsunami that it generated surprised many geoscientists. Evidence has since emerged that the earthquake rupture spread unusually close to the deep Sunda Trench, which forms the boundary between the converging Indo-Australian and Eurasian plates in the north-eastern Indian Ocean. This was unexpected because the weak marine sediments usually found at regions where tectonic plates converge would normally help absorb energy released by an earthquake, stopping the rupture progression. 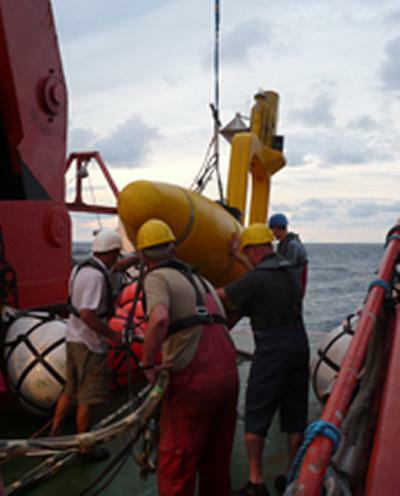 "By investigating the geological characteristics of the margin landward of the Sunda Trench, of the deep seabed and the sediments beneath, we hoped to gain a better understanding of why the earthquake generated such a large tsunami," explains Dr Tim Henstock, also a co-author based at the University of Southampton. To assess the structure of the Earth's crust in the critical area, the US-led team of researchers collected and analysed seismic reflection images beneath the seabed, along 1,250 kilometres of the southern part of the rupture zone. They acquired these data while aboard the German research vessel Sonne in the summer of 2008. Their results indicate the presence of large consolidated and compacted blocks of sediment uplifted and faulted by the subduction process. These sediments are derived from underwater flows of sediment (turbidites) that form the Nicobar Fan at the eastern tip of the vast Bengal Fan and are up to four kilometres thick on the subducting Indian tectonic plate. The thick sediments have been thrust landward to form a strong marginal plateau with a width of around 130 kilometres. "It appears that the 2004 rupture propagated beneath this plateau, further seaward than expected, and the depth and solidity of the sediments forming the plateau have played a part in the power of the devastating tsunami that the earthquake generated," says Tim. The researchers' findings imply that tsunami hazards may be more severe along continental margin regions where trenches contain thick compacted and strong sediment. The research was supported by the National Science Foundation of the United States of America and the United Kingdom's Natural Environment Research Council.